What piles up the most around your house? Does your laundry grow into a mountain of clothes before it makes its way down to the washer? Are there stacks of dishes waiting to be put away? Maybe it is shoes in the closet that seem to grow every week? Those are actually manageable piles of stuff that you can easily take care of. The more challenging piles are those things that can simply be tossed into the garbage can. Things like excessive amounts of cardboard boxes or bulky pieces of furniture. For those kinds of removal, you need to bring in the pros from Junk King Palm Beach. Thanks to all the online shipping deals, cardboard boxes are showing up at our homes with more frequency. It is understandable that you would want to hold onto the box to make sure you’re not going to ship the item back. But that’s when the piles start build up. Before you know, you’ve got more cardboard boxes than you know what to do with. That’s when you want to call in Junk King. 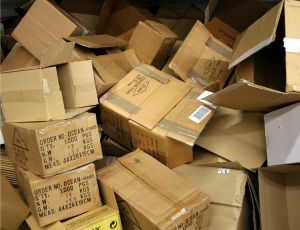 The crew from Junk King will be able to break down those boxes and get them out of your home for good. Junk King always sends over at least two strong movers to get the job done. All you have to do is show them what you want taken away and they’ll handle everything. Two movers means just about any oversized or heavy object can be taken out of your home. They’ll even sweep up the empty spot before they leave. All those cardboard boxes that you’re getting rid of will be the perfect items to drop off at a recycling center. Junk King will strive to make that happen. They make those kinds of drop offs every week. They also can drop the rest of your stuff off at a charity. That way it can be put back into circulation instead of ending up on a trash heap it is a much greener way of disposing of things. Don’t let your old cardboard boxes and other rubbish pile up. Get rid of it all with one call to Junk King Palm Beach. This entry was posted in Palm Beach Junk Removal on March 24, 2018 by Junk King. Last updated March 24, 2018 .